It’s been eight years since I registered a hot rod springer pup with the American Kennel Club (AKC). And that was the first time I’d ever done so. When the registration came in the mail, it was accompanied with a few pieces of literature that the AKC believed would be helpful. One of these papers was information advocating the AKC sponsored pet health care plans. I vividly remembered laughing out loud at such a notion. What a scam! I pictured some over protective owner that only wanted the very best for Twinkles the poodle. Certainly not for me! My new pup was fearless. When grouse hunting, he would hit dead falls at full speed, sending branches flying. There were several times that such an event would be accompanied by a yelp - and the owner hoping the snap I heard was a branch and not a bone. In his first few years, he built an impressive file at the vet. Several stitches, a face full of porcupine quills, torn nails, stalks of grass stuck up his nose and a few things imbedded in his body. He had to have the vet help remove things from his eyes as well as tending to a reaction to a vaccine. The only thing that seemed certain was the dog wasn’t going to slow down and that vet bills were just a part of that fact. Rev was a hell of a dog and the vet bills seemed a small price to pay. "Test upon test, spinal and joint taps, loads of blood tests for every imaginable condition all failed to disclose the source of his ailment. There were several times I was believing we were going to loose him." Just as Rev was about to turn five, Rev became NFC Lighthouse Reverence. Within a week of winning the national, it became clear that something wasn’t quite right. He could not jump into his kennel. He required help. Over the next few weeks, his conditioned worsened. His regular vet tried everything she could think of, but referred me to the University of Wisconsin Veterinary Teaching Hospital when diagnosis proved difficult. Rev was loosing control of his hind legs, but did respond to an antibiotic. Test upon test, spinal and joint taps, loads of blood tests for every imaginable condition all failed to disclose the source of his ailment. There were several times I was believing we were going to loose him. Over three months had passed. There was several thousand dollars of debt being carried on the credit card and I felt I could no longer justify testing that was getting more and more expensive. I made the decision to treat him with a cocktail of doxycycline and prednisone in hopes that the condition would become known before it killed him. Rev’s story turned out to have a happy ending. It was only a week latter that an abscess came to the surface. It had remained sealed under his backbone for four months. The surgery was successful even though there was a large amount of muscle tissue lost in the operation. His recovery was immediate and I had my old dog back. A few months ago, I registered one of Rev’s pups with AKC. I received the same pamphlet advocating the health plan. I wasn't laughing anymore. Rev’s health care caused a financial situation that took me a couple years to recover from. I made a decision to insure that pup, as well as my current trial dog, Rum. For dogs that spend time in the fields, the dangers are always present. I have friends that have had fungal diseases, car accidents, drug reactions and more than a few with pneumonia type disorders of a bacterial nature. Better safe than sorry.... Right? Just one month after I purchased the policy, Rum felt under the weather and a few days later I thought he was breathing a bit differently. My vet insisted that I come in immediately. From the time she first saw him to the time I was on the road to the University Vet School was, perhaps, ten minutes. That was a Monday. On Friday I was taking him back home. The total bill was $4200. They split his sternum and removed a large part of the tissue separating his heart and lungs. The probable cause was inhalation of a piece of foxtail grass that caused a bacterial infection. Rum’s situation also had a happy ending. Slightly more than two months after his surgery, he finished with second place in his first trial since his operation. To top off that accomplishment, I recently received a check for $3000 for the insurance company’s portion of the bill. I’m not endorsing any health plan. Each has its own advantages, limitations and exclusions. My suggestion would be to examine what is available and discuss them with your veterinarian. Perhaps pet health plans are not for you. Just don’t laugh... it’s not funny anymore! When Loretta asked me to write a paragraph or two as a bio, I had some difficulty. The dogs have taught me much more than I could have ever taught them. 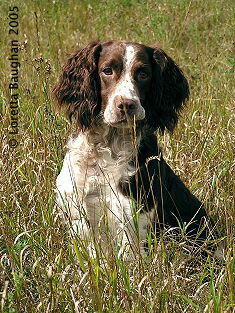 I’ve had spaniels in the home for 25 years and enjoy spending time in the field with these great dogs. Eight years ago I brought my first true field bred Springer home and my life hasn’t been the same since. The learning curve has been steep and I would have been overwhelmed had it not been for some truly great training partners that shared their vast experience. That first field bred spaniel, Rev, was co-handled by Jason Givens and myself to become the National Hi-Point puppy in 2000, and he was handled by Jason to win the National Open in 2003. 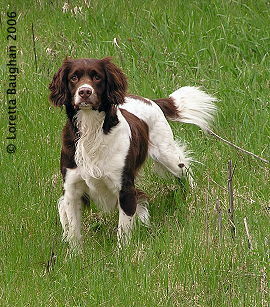 Rum, my second field bred Springer, has been a joy to train and I was able to handle him to his Canadian field trial championship and we were blessed to have placed in the Canadian National in 2004. I’m currently working on Rum’s US titles, and have added one or Rev’s pups to the household to keep me busy. The credit goes to the dogs and those willing to assist me along the way.